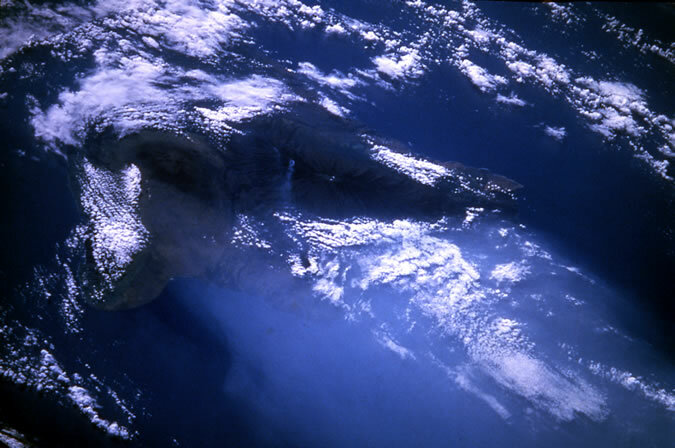 The eruption of Mauna Loa on Hawai‘i in 1984 produced an eruption plume that can be seen emitting from the volcanic vent in this photograph. The smoke in the photograph comes from burning vegetation along the front of the two lava flows. The volcano vented sulfur dioxide that quickly combined with atmospheric moisture to produce a sulfuric acid haze. Condensed droplets of sulfuric acid rose into the atmosphere and drifted downwind. As this shuttle photograph shows, the haze plume could be tracked for several hundred miles from the volcano. As a result, sunlight penetration of the atmosphere can be reduced, and sunrises, and particularly sunsets, take on unnatural coloring. When we think in terms of the agricultural or climatic impacts of such upper-level pollution, or when making comparisons with the atmospheric and climatic effects of a nuclear holocaust, it is worth remembering that this was a very small volcanic eruption. STS 41-C, April 1984. Picture #13-37-1807.